All parents hope that their children have healthy and happy childhoods free of serious medical issues. However, a significant number of children require specialized medical care every year. Listed here are the 20 most innovative pediatric surgeons alive today. Each one of these surgeons (presented here in alphabetical order according to last name) changed the field of pediatric medicine forever, saving the lives of many children around the world. In building this list, we looked for individuals who've pioneered significant pediatric surgical procedures, or who have contributed to the field in some other widely recognized revolutionary fashion. Dr. Scott Paul Bartlett is a pediatric surgeon with The Curtis Center and the director of the Craniofacial Program at the Children's Hospital of Philadelphia (CHOP). He is the professor of plastic surgery at the Perelman School of Medicine at The University of Pennsylvania. He is also the current president of the International Society of Craniofacial Surgery. Dr. Bartlett specializes in facial palsy, mohs reconstruction and craniomaxillofacial surgery. His innovative research has changed the field of pediatric plastic surgery. His current research includes using 3-D imaging measurement techniques to define deformities associated with synostosis and hemifacial microsomia. He is also developing novel forms of single suture synostosis. Dr. Bartlett currently holds patents on novel soft tissue implants and methods of draining and filling soft tissue implants. While technically an anesthesiologist and not a surgeon, Dr. Stephen Bolsin has contributed substantially to the world of pediatric surgery. He became an anesthesia consultant at the British Royal Infirmary in 1989. From 1991 until 1996, he was the National Audit Coordinator for the Association of Cardiothoracic Anaesthetists of Great Britain and Ireland. In 1996, he served as the director of the Department of Perioperative Medicine at the Geelong Hospital in Victoria. Soon after beginning his career as a consultant at the British Royal Infirmary, Dr. Bolsin noticed that there were many babies dying during heart surgery. After six years collecting data and attempting to improve outcomes, the hospital began to see a fall in mortality rates from 30% to less than 5%. After the hospital refused to investigate the pediatric cardiac surgeons, Bolsin contacted the media. These whistleblower actions resulted in an investigation by the government as well as the drafting of the Kennedy Report, the first major document outlining areas of reform of clinical governance in the hospitals of the UK. Following the investigation, Bolsin left the UK and began to work to improve patient safety in Australia. Dr. Redmond P. Burke is the founder of the Congenital Heart Institute at the Miami Children's Hospital and the Arnold Palmer Hospital in Florida. Dr. Burke was a pioneer in pediatric cardiac surgery, performing the world's first endoscopic vascular ring division and the world's first thoracic duct ligation at Children's Hospital Boston. He also performed the United States' first minimally invasive repair of the patent ductus arteriosus. He performed New England's first three pediatric heart-lung transplants. Burke also developed a series of thoracoscopic surgical instruments for use in minimally invasive pediatric cardiac surgery. At only 36, he became the chief of pediatric cardiovascular surgery at Miami Children's Hospital, where he continued to be a pioneer in the field. His specialization was the reduction of trauma by developing less invasive treatments for heart defects. Recently, he developed a transcatheter pulmonary valve and performed the first open tricuspid valve replacement on a patient with a transcatheter valve. Dr. K. M. Cherian is a cardiac surgeon in India and the United States. He has worked at Christian Medical College Hospital in Vellore, the University of Oregon, and the Yangzhou University in China. He is currently the chairman and CEO of the International Centre for Cardio Thoracic and Vascular Diseases and the Dr. K. M. Cherian Heart Foundation at the Pushpagiri Institute of Medical Sciences and Research Centre in India. From 1990 to 1993, he was the honorary surgeon to India's president. He has performed over 36,000 surgeries, including India's first heart transplant after brain death, the first bilateral lung transplant, India's first pediatric heart transplant and the nation's first heart and lung double transplant. As a humanitarian gesture, Dr. Cherian operated on 20 Iraqi children with complex heart defects. He is the first and only member from India of the American Association for Thoracic Surgery. He is also a Fellow of the Royal Society of Medicine in London, England. Dr. Frederic Deleyiannis is a plastic and reconstructive surgeon for the University of Colorado Anschutz Medical School. He is also an associate professor of plastic surgery for the school. Dr. Deleyiannis is the director of the Cleft Lip and Palate Program and the Director of Craniofacial Microsurgery and Trauma in the Pediatric Plastic Surgery department at the Children's Hospital of Denver. He also volunteers as a plastic surgeon with Children of the Americas, Inc., providing surgical care to children in need in Guatemala. He specializes in reconstructive surgery for children with cleft lip or traumatic injury. With his unique dual certification in plastic surgery and otolaryngology, he is also able to operate on the nose and ear. He has performed many complex reconstructions and microvascular surgeries on patients who experienced significant cancer-related surgery. He strives to improve the quality of life of every patient while also striving for cost-effectiveness. To date, Dr. Deleyiannis has published over 60 articles focusing on plastic surgery, cleft-craniofacial surgery and surgery of the head and neck. Dr. Stephen Elliot Dolgin is a general pediatric surgeon with affiliations at Lenox Hill Hospital, North Shore University Hospital, Long Island Jewish Medical Center and the Steven and Alexandra Cohen Children's Medical Center of New York. He is also a professor of surgery and pediatrics at the Hofstra NS-Long Island Jewish Medical School. He is a leading researcher on pediatric inflammatory bowel disease, ovarian pathology and neonatal surgery. His innovative research helped in maximizing ovarian salvage during the treatment for pediatric idiopathic adnexal torsion as well as new treatments for neonatal ovarian masses. Dr. Francois Fontan and Dr. Guillermo Kreutzer are pediatric cardiac surgeons who pioneered a surgical treatment for tricuspid atresia now known as the Fontan Procedure or the Fontan/Kreutzer Procedure. This procedure is most commonly used in infants and toddlers with significant heart defects. Most children referred for this procedure only have one effective heart ventricle due to defects, a condition such as hypoplastic left heart syndrome, or previous heart surgery. With this procedure, Dr. Fontan was the first surgeon in the world to completely bypass the right heart. He was also the first to channel the IVC and SVC blood towards the pulmonary arteries. Kreutzer offered modifications to the procedure allowing for continuity of the pulmonary arteries. This procedure has drastically reduced mortality from the tricuspid atresia. Prior to the development of the Fontan Procedure, only a third of patients lived to 12 months of age and only 10% were still alive at 10 years old. Since the development of the Fontan Procedure, most patients survive well into the third or fourth decade of life. Dr. William Frist was both a heart and lung transplant surgeon and the two-term senator from Tennessee. A graduate of the Harvard Medical School, he began training in cardiovascular physiology while working at a research lab at the Massachusetts General Hospital. He was a senior registrar in cardiothoracic surgery at the Southampton General Hospital in England and the chief resident in cardiac transplant and cardiothoracic surgery at the Stanford University School of Medicine. Dr. Frist developed the heart and lung transplantation program at the Vanderbilt University Medical Center. He also founded the Vanderbilt Transplant Center. In his career, he has performed over 150 heart transplants and lung transplants, with many patients being pediatric patients. A significant number of Dr. Frist's transplants have been combined heart and lung transplants. He is the United States' leader in heart and lung transplants and has saved the lives of many children and adults with his innovative surgical techniques. Dr. Michael Harrison is a professor of surgery and pediatrics at the University of California, San Francisco Fetal Treatment Center, where he was the founder and now also serves as director emeritus. He previously served as the chief of pediatric surgery at the same hospital. He is a world-renowned expert on fetal surgery. In 1981, Dr. Harrison performed the first open fetal surgery in order to correct an advanced urinary tract obstruction. He developed and pioneered the use of fetendo and fetal image-guided surgery in order to correct birth defects in fetuses using pregnancy. Widely known as the "Father of Fetal Surgery", Harrison published the comprehensive textbook on prenatal therapy, The Unborn Patient: Prenatal Diagnosis and Treatment. His Fetal Treatment Center has treated over 15,000 birth defects, including the first open fetal surgery for congenital diaphragmatic hernia and the first resection of a fetal sacrococcygeal teratoma. He also developed a uterine stapling device, and radiotelemitters to monitor fetal conditions during surgery. Dr. MÃ¼nci KalayoÄlu is the head of the organ transplantation and general surgery department at Istanbul's Memorial Hospital. Previously, he worked at the Children's Hospital of Pittsburgh and founded the Liver Transplantation Program at the University of Wisconsin. A leading pediatric surgeon, Dr. KalayoÄlu has performed more than 1,500 liver transplants, including Wisconsin's first liver transplant, the state's first reduced-size liver transplant, the first cluster transplant, the first adult-to-adult living donor liver transplant, the first pediatric liver transplant and the transplant on the state's smallest liver transplant recipient. He also performed Wisconsin's only separation of conjoined twins. He also pioneered the use of the Belzer UW organ preservation solution in clinical liver transplantations. Dr. Jessica Kandel is the surgeon-in-chief for The University of Chicago Medicine Corner Children's Hospital, as well as the hospital's professor of surgery and the vice-chair of pediatric surgical services. Dr. Kandel has also worked for the Massachusetts General Hospital, Boston Children's Hospital and Columbia University. She founded the Vascular Anomalies Group at the University of Columbia in order to treat pediatric hemangiomas, lymphatic tumors and vascular malformations. She was the first to describe tumor suppression by blocking the Vascular Endothelial Growth Factor molecule. This tumor suppression drug was marketed as Avastin and is used to treat colorectal cancer in adults as well as several types of adult and pediatric tumors. She has also recently developed a novel mouse model of lymphatic malformations. Dr. Tomoaki Kato is the surgical director of adult and pediatric liver and intestinal transplantations at the New York-Presbyterian Hospital and the Columbia University Medical Center. He is also the professor of surgery at the Columbia University College of Physicians and Surgeons. Previously, Dr. Kato was the director of pediatric liver and gastrointestinal transplant at the University of Miami School of Medicine. Dr. Kato is a pioneer in multiple-organ transplantation, as well as a world-renowned surgeon for pediatric and adult liver transplants. He performed the first human partial bladder transplantation by transplanting two kidneys with ureters connected to a patch of a donor bladder. He also performed a six-organ transplant in order to excise an abdominal tumor. He developed the Auxillary Partial Orthotopic Liver Transplantation procedure, known as APOLT in order to resuscitate failing livers by attaching partial donor livers. He has written over 180 articles in peer-reviewed journals. Dr. Burton Kushner is a pediatric ophthalmologist specializing in the treatment of strabismus. He is the director of pediatric ophthalmology and adult strabismus service at the University of Wisconsin-Madison Medical School. He is also the founding editor-in-chief for the Journal of the American Association for Pediatric Ophthalmology and Strabismus. He pioneered research and surgery for strabismus and demonstrated marked improvement in the visual fields of those recovering from strabismus surgery using his techniques. He also pioneered corticosteroid treatment in order to treat periocular capillary hemangioma as well as contributed research on the elucidation of torsional in patients with diplopia. Dr. John Meara is the associate professor of surgery and the associate professor of global health and social medicine at the Harvard Medical School. He is also the plastic surgeon-in-chief at Children's Hospital Boston. He is the director of the Paul Farmer Global Surgery Fellowship program in order to train doctors and community leaders and make surgical care, education and research on craniofacial anomalies accessible around the globe. He performs craniofacial surgeries at the Advanced Fetal Care Center of Children's Hospital Boston in order to treat cleft lip and palate as early as possible, increasing the likelihood of positive outcomes and reducing the risk of feeding and speech complications. He pioneered research in the economic impact of surgical interventions in third world and low-income countries. He also developed programs to research the quality, safety and effectiveness of cleft lip and palate surgery in low-income nations. His primary practice goal is to reduce the burden of significant surgical diseases around the world so that appropriate care is affordable and accessible to children in any country. Dr. Henry Metz is a pediatric ophthalmologist and serves on the medical advisory board for the Better Vision for Children Foundation. Previously, he was the chair of the ophthalmology department at the University of Rochester Eye Institute, the editor-in-chief of the Journal of Pediatric Ophthalmology and Strabismus and the president and lecturer at the American Association for Pediatric Ophthalmology and Strabismus. He pioneered research into the use of botulinum toxin in the treatment of strabismus and unilateral acute sixth-nerve palsy. Botulinum toxin therapy drastically changed how optical disorders were treated, sharply decreasing the number of complications and poor outcomes in cases of strabismus and other congenital eye defects. He also heavily contributed to research on the saccadic velocity measurements in internuclear ophthalmoplegia. Dr. Marilyn Miller is a pediatric ophthalmologist who specializes in the treatment of strabismus and congenital eye disease. She is the leading female researcher and practitioner in the field, serving as the first president of the American Association for Pediatric Ophthalmology and Strabismus and the first female board member of the American Academy of Ophthalmology. She is a professor of ophthalmology at the University of Illinois Eye and Ear Infirmary, where she also served as the director of pediatric ophthalmology and adult strabismus service from 1984 through 2002. She also served as the editor-in-chief for the Journal of the American Association for Pediatric Ophthalmology and Strabismus and president of the American Ophthalmological Society. She was the first to describe associations between Duane syndrome and dyslexia, thalidomide toxicity and first trimester anomalies. She also pioneered research on Mobius syndrome, fetal alcohol syndrome and Parry-Romberg syndrome. In the 1990s, her work on eye motility problems in children with thalidomide toxicity also contributed to research into the cause of autism spectrum disorders. She has treated patients all over the world, focusing on Nigeria. Dr. John Pratt-Johnson is a pediatric ophthalmologist specializing in blindness prevention. He is a professor emeritus at the University of British Columbia in the ophthalmology department. He also served as the president of the American Association for Pediatric Ophthalmology and Strabismus. He was the co-writer for the highly used textbook for managing strabismus, amblyopia and other optical disorders, Management of Strabismus and Amblyopia: A Practical Guide. He was on the board of directors for Seva where he helped to build medical facilities and train ophthalmologists in Nepal to treat and prevent blindness. He frequently served in third world and impoverished nations, providing surgical expertise and education on blindness prevention. Dr. Mohammed Rela is one of the world's top liver transplantation surgeons and specializes in pediatric liver transplantation. He is the head of the liver, pancreatic diseases and transplantation department at the Global Hospitals and Health City Group in Chennai. He is a Fellow of the Royal College of Surgeons. He also worked at the King's College Hospital where he was actively involved in liver transplantation. He pioneered the split liver transplantation technique. He has performed more than 1,200 liver transplantations, including one on a five-day-old female. He performed the first living related liver transplant, which was performed on an 18 month old girl with a prognosis of only 48 hours to live prior to the operation. Dr. Rela successfully performed a liver transplant on a four-year-old with terminal stage liver cancer. Dr. Rela also pioneered the swap liver transplantation for adults. He also performed six liver transplants and a bone marrow transplant on one patient. He is known in India and around the world for successfully performing highly complex surgeries to save the lives of very young children. Dr. Anthony Sandler is the chief of pediatric surgery at Children's National Medical Center. He is also a lead investigator for the Children's Research Institute and the Center for Cancer and Immunology Research. At George Washington University School of Medicine and Health Sciences, he is the professor of surgery and pediatrics. He is currently leading research on tumor immunology in order to investigate immunotherapeutic strategies to treat tumors. This work is being supported by the National Institutes of Health. Dr. Sandler developed TLR agonists for use with tumor vaccine therapies in order to target the activation of host immunity. He is known around the world for his innovative techniques in the area of surgical repair of gastrointestinal tract congenital anomalies. Dr. Mark Urata is the head of the plastic surgery division at Children's Hospital Los Angeles. He is also the co-director of the Cleft Team at Los Angeles' Shriner's Hospital. Dr. Urata has previously served as the director of craniofacial surgery and medial director of plastic surgery at Children's Hospital Los Angeles. He is double board-certified in plastic surgery and oral and maxillofacial surgery. Dr. Urata holds medical and dental degrees, making him able to operate on otherwise extremely difficult craniofacial cases. He is a specialist in complex craniofacial anomalies such as craniosynostosis, Treacher-Collins syndrome and Apert syndrome. He is also a specialist in the reconstruction of jaw deformities. Dr. Urata is the lead researcher for the International Craniofacial Children's Fund in order to provide complex surgeries to children with severe craniofacial abnormalities in low-income nations. He also works with the Teledentistry/Telecraniofacial Program in order to work with underserved populations using state-of-the-art technology. He strives to make sure that all children with severe and complex craniofacial abnormalities receive the treatment needed for survival and increased quality of life, especially in for children who could not otherwise afford treatment. Healthcare has seen huge leaps in advancements over the last century. From the 1960s on, the application of technology to medical science research began to allow physicians and scientists to study things that just a few years before, we didn't know existed, and had no way of discovering. This list consists of a diverse array of living titans in the medical research field. Nobel Prize and Lasker Award winners, these scientists are responsible for discovering things that have saved millions of lives, and have the potential to save even more. The list is diverse, featuring scientists from all corners of the field, and the globe, who have made and are making significant medical advancements. Ferrara is a molecular biologist that specializes in cancer research. He is a Genentech Fellow in Tumor Biology and Angiogenesis. Ferrara's Lasker Award, however, was given for a different application of his research that led to an effective treatment of age related wet macular degeneration. Ferrara earned his medical degree from the University of Catania, Italy. Horwich is a biologist and the current Eugene Higgins Professor of Genetics and Pediatrics at Yale School of Medicine. He pioneered the practice of protein folding and his discoveries in that field have been applied across the discipline of genetics ever since. Horwich entered a program at Brown that was one of the first to combine the earning of a bachelor degree and medical degree. Upon graduation he went on to work with prestigious organizations like the Salk Institute, and the Max Planck Institute of Biochemistry. Horwich received a Lasker Award for his discoveries regarding protein folding. Sheetz is a cell biologist at Columbia University and was the founding director of the Mechanobiology Institute of the National University of Singapore. Sheetz earned his bachelor's degree at Albion College and his Ph.D. at the California Institute of Technology. Sheetz is a recipient of both the Wiley Prize in Biomedical Science, which recognizes outstanding research that advances our knowledge of biological systems and processes, and a Lasker Award for discoveries concerning cytoskeletal motor proteins. Sir Martin Evans is a British developmental biologist and was the first recorded scientist to culture the embryonic stem cells of mice and cultivate them in a lab, an act that has earned him the moniker "stem cell architect." Evans also pioneered gene targeting for the purpose of genetic engineering in mice. Genetically modified mice have since become a tool crucial to medical research. Evans, who studied at Christ's College at Cambridge and University College London, was awarded a Lasker Award in 2001 and the Nobel Prize in 2007. He has taught at Cardiff University, Christ's College at Cambridge, and University College London. This British Biologist shared a Nobel Prize in 2002. Sulston's primary research has been in human genetics and he has worked with some of the most prestigious organizations in the world including the Salk Institute for Biological Studies, the Medical Research Council Laboratory of Molecular Biology, and the Wellcome Trust Sanger Institute, on top of having taught at Cambridge and the University of Manchester. John Sulston is a graduate of Pembroke College at Cambridge. This British biochemist shared a Nobel Prize in 2001 for discovering protein molecules that control the division of cells, leading to a much greater understanding of cell reproduction in living organisms. Hunt discovered two proteins that help regulate the transition of cells from one form to another. His work moved our understanding of the reproduction of cancer cells, moving research on cancer forward. Hunt studied at the University of Cambridge, where he later taught, is a fellow of the Royal Society, and worked with Cancer Research UK. This South African biologist contributed greatly to efforts to understand the genetic code. Brenner and George Pieczenik were the first to utilize computer analysis to study nucleic acids. He earned degrees from the University of Watersrand, and Oxford, and was a postdoctoral fellow at U.C. Berkeley. Throughout his career he has worked at King's College at Cambridge, the Molecular Sciences Institute, the University of Watersrand, and U.C. Berkeley. This British M.D. is a prominent researcher in molecular genetics, haematology, and pathology. He is one of the leading experts worldwide on thalassemias, blood disorders that cause anemia and other complications. The focus of his research has been on the molecular foundation of thalassemias, and the application of that knowledge to controlling the disorders. Weatherall graduated with his medical degree from the University of Liverpool and has worked with the Institute of Molecular Medicine at Oxford, been a member of the Nuffield Council on Bioethics, and written important works for the World Health Organisation. Weatherall received a Lasker Award for his long career devoted to the advancement of biomedical science and bioethics. An American neurologist, Greengard's significant contributions to the medical field are his discoveries regarding the molecular and cellular functions of neurons. Greengard shared a Nobel Prize in the year 2000 for discoveries that furthered our knowledge of signal transduction in the nervous system. He studied at Johns Hopkins University, Hamilton College, and Cambridge, and is current the Vincent Astor Professor at Rockefeller University. He has also held positions at Vanderbilt and Yale. This molecular biologist and geneticist shared the 1968 Nobel Prize in Physiology or Medicine with 2 others for their discoveries of the molecular structure of nucleic acids, or, the double helix, and the structure's significance regarding the transfer of information in live organisms. Watson and his colleagues made this discovery while working at Oxford. Watson studied at the University of Chicago and Indiana University. Watson was appointed head of the Human Genome Project in 1990, and was an early advocate against the practice of patenting human genes and DNA. This American medical researcher and pharmacologist was born in Brooklyn, New York, the son of an uneducated carpenter. In 1998 Ignarro was awarded the Nobel Prize in Physiology or Medicine for his discovery of the signalling properties of nitric oxide. Ignarro studied at Columbia and the University of Minnesota and is currently professor of pharmacology at UCLA. His early research collaborations at the National Institutes of Health lead to an increased understanding of the cardiovascular system in the medical community. His discoveries have led to the development of many medicines including nutritional supplements that improve cardiovascular health, and Viagra. He has written five major works on the implications of his research into the health properties of Nitric Oxide. One of the foremost cancer researchers in the world, Varmus was awarded a Nobel Prize in 1989 for his discovery of the cellular origins of retroviral oncogenes which has been instrumental in the fight against cancer. Varmus, who attended Amherst College, Harvard University, and Columbia University, is one of three co-chairs of the President's Council of Advisors on Science and Technology. He also is the director of the National Cancer Institute, and a member of the Council on Foreign Relations. This Canadian researcher studied at McGill University and Cornell. Szostak is now a Professor of Genetics at Harvard Medical School. Szostak received a Nobel Prize in 2009 which he shared with Elizabeth Blackburn for their co-discovery of how chromosomes are protected by telomeres. Szostak also received a Lasker Award (2006), Genetics Society of America Medal, and a Dr. A.H. Heineken Prize (2008). His discoveries haven't been limited to the one for which he was awarded the Nobel Prize. He also is credited with constructing the world's first artificial yeast chromosome, and he was instrumental in the successes of the Human Genome Project. This American professor of cellular and molecular biology studied at the University of Colorado, Vanderbilt and holds several honorary degrees. Maniatis is a biotech pioneer and has been involved with some of the largest biotech firms in the world, including co-founding the Genetics Institute. He was awarded the Lasker-Koshland Special Achievement Award in Medical Science along with Donald D. Brown for their numerous discoveries that have advanced the field of biomedical science. This Swedish medical researcher was awarded the Nobel Prize in 1981 for discoveries regarding the processing of information by the visual system. His discoveries regarding sensory processing moved the medical field and our understanding of the workings of the human body forward by leaps and bounds. Torsten Weisel studied at the Karolinska Institute, a Stockholm medical university. His discoveries opened the door for the treatment of childhood cataracts and Strabismus. 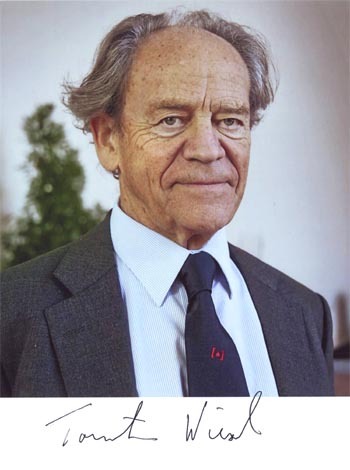 Wiesel was also awarded the National Medal of Science in 2005, and the Order of the Rising Sun, Grand Cordon, one of the highest honors bestowed by the nation of Japan. A graduate of Ursinus College and the University of Pennsylvania School of Medicine, Gerald Edelman has been responsible for major discoveries regarding the structure of antibodies. Edelman discovered that antibodies evolve to better meet the needs of our bodies as we age, and drew correlations between that evolution and the evolution of the human brain throughout life. Edelman was awarded a Nobel Prize for his antibody research, and is the founder and director of non-profit organization "The Neurosciences Institute." This Australian microbiology and immunology researcher co-discovered an enzyme that protects chromosomes. The understanding that flows from her research has given medical researchers a greater understanding of aging. In studying the chromosome and its protective substance, it was discovered that humans age as the substance deteriorates, and there are certain circumstances that cause the substance to deteriorate more rapidly. She was awarded a Nobel Prize for her discovery. Blackburn earned her degrees from the University of Melbourne and Darwin College at Cambridge. This doctor pioneered organ transplantation, and performed the first liver transplant operation in Europe in the 1960s. He also performed the first liver, heart, and lungs transplant in the 1980s, the first intestinal transplant in England in the 1990s, and the first combined transplant of stomach, liver, kidneys, and pancreas in 1994. He received a Lasker Award in 2012 for pioneering transplant medical procedures that have been responsible for saving thousands of lives. This Chinese medical scientist and pharmaceutical chemist received a Lasker award for discoveries of artemisinin and dihydroartemisinin which are used to treat malaria. It is estimated that her discoveries have saved millions of lives. Youyou attended Beijing Medical College. Youyou has no postgraduate degree, and is not a member of any of the prestigious Chinese academies. Before receiving the Lasker Award in 2011 she had been almost completely forgotten by the world; but the impact of her work has only grown. Gurdon is a developmental biologist who pioneered research in cloning and nuclear transplantation. In 2009 Gurdon received a Lasker Award, and in 2012 he and Shinya Yaminaka were awarded the Nobel Prize in Physiology or Medicine for discovering that mature cells can be converted into stem cells. Gurdon studied at and worked for Christ Church, Oxford, and has worked for Cambridge, and the California Institute of Technology. In 2004 the Wellcome Trust/Cancer Research UK was renamed The Gurdon Institute. History abounds with tales of hugely tall men and women, but it's only in the past couple of hundred years that we've had medical explanations for the phenomenon. Pituitary gigantism, Marfan syndrome, eunuchoid tallness, Sotos syndrome, and acromegaly are all conditions that can cause those afflicted to grow beyond the human norm. Pituitary gigantism is by far the most common cause of extreme height. It usually occurs due to over-secretion of growth hormone from cells in the pituitary gland or as a result of a tumor on this same gland at the base of the brain. Many of the world's largest individuals – from the tallest person ever, Robert Wadlow, to the world's current tallest living man, Sultan KÃ¶sen – have suffered from conditions related to their pituitary glands. Yet the stories of the individuals affected by gigantism are as interesting as the causes behind their conditions. Read on for the 10 tallest recorded people in history. Brahim Takioullah is the joint second-tallest living person in the world, alongside Iranian man Morteza Mehrzad. Takioullah also holds the Guinness World Record as the owner of the "world's largest feet on a living person" (and the second largest in history) at over 15 inches in length. Takioullah was born in Morocco in 1982, and his size is the result of a tumor that affects his pituitary gland. The tumor has increased the levels of human growth hormone in Takioullah's system, and the effects are there for all to see. The Moroccan giant's condition was diagnosed when he was 18, after a school doctor concerned about his "unusual" size suggested that he should get a blood test. As you can imagine, Takioullah's stature causes significant problems in his day-to-day life. He can't stand up straight in the small flat he shares with his mother, and he has difficulty using a car or taxi. He also needs to wear special shoes designed by his orthopaedic podiatrist to support his weight. Denton, Montana-born giant Don Koehler reached an incredible height of 8 ft 2 in. His growth was normal until the age of 10, when he suddenly shot up at an alarming rate. He was the tallest man in the world from 1969 until his death in 1981. The inconveniences to Koehler's everyday life included him having to put two double beds together when he stayed in hotel rooms; a difficulty finding somewhere to live that had a ceiling high enough (and no hanging light fixtures); and bumping his head when he had a cold. Koehler's twin sister was only 5 ft 9 in tall, making the 29-inch difference between the twins a Guinness World Record. Towards the end of his life, Koehler suffered from kyphosis, which reduced his stature through curvature of the spine. He died in Chicago at the age of 55 from a reported heart condition. By then his height had shrunk to 7 ft 10 in. Not a lot is known about Indian giant Vikas Uppal's short life, and his tallest-man claim is a controversial one. Born in the Rohtak district of Haryana in 1986, he was never officially measured by the Guinness World Records. According to Indian newspaper The Tribune, Uppal was 8ft 3in and still growing when he was measured in his late teens. Indian news and entertainment website Rediff.com also claim to have measured Uppal, in 2005, and reported that he was 8ft 10in – which would make him the second tallest person in human history. Other reports claim that he was 8ft 9in, but his generally accepted height is 8ft 3in. Notwithstanding such debate, tragically, Uppal died on the operating table on June 30, 2007, when doctors tried unsuccessfully to remove a tumor from his brain. Bernard A. Coyne was born in Anthon, Iowa on July 27, 1897. He suffered from eunuchoidal infantile gigantism, which is an extremely rare condition commonly referred to as daddy-longlegs syndrome. Coyne's exact height at the time of his death is still unconfirmed. According to his WWI registration card, he was already 8-ft tall in 1918, at which time he was just 21 years old. When he died in 1921, aged 23, Coyne measured 8 ft 2 in, although according to some sources, he could have been as tall as 8 ft 4 in. Regardless, Coyne is one of only a handful of people in recorded medical history taller than 8 feet. His life was, however, tragically cut short in his early twenties. Coyne's official cause of death was hardening of the liver and glandular fever. He was buried in his hometown in a custom-built coffin. At 8 ft 3 in, Turkish part-time farm laborer Sultan KÃ¶sen is the tallest living man in the world. Like many of the other people on this list, KÃ¶sen's condition is caused by a tumor affecting his pituitary gland that has been linked to acromegaly. And as with Koehler, KÃ¶sen's growth rate was normal until the age of 10, at which point he quickly shot up to over six feet. The colossal Turk was unable to complete his education due to his staggering height and need to walk with crutches. An attempt to remove KÃ¶sen's tumor in 2008 was thought to have been successful, but in the end it failed to arrest his accelerated growth rate. In 2010, because the tumor was buried so deep in KÃ¶sen's brain, doctors at the University of Virginia used a "gamma knife" technique, focusing beams of radiation to remove the growth. Due to KÃ¶sen's size, special equipment had to be flown in from Sweden. In 2012, it was confirmed that the supersized celebrity had finally stopped growing. Born in Saskatchewan, Canada in 1881, Edouard BeauprÃ© also reached the incredible height of 8 ft 3 in. As a child, BeauprÃ© had dreams of being a cowboy, but he may have changed his mind when he turned 17 and discovered that he could lift an 800-pound horse. When he was 21, BeauprÃ© joined Barnum and Bailey's Circus as a strongman and circus freak. The French Canadian giant's feats included lifting heavy horses and wrestling one of the world's strongest men, Louis Cyr. During the wrestling match, he hardly dared to lay a finger on his opponent, leading to Cyr's victory. Sometimes BeauprÃ© suffered for his art, and he once broke his leg lifting a 900-pound weight. Towards the end of his life, BeauprÃ© suffered from tuberculosis and felt weak and dizzy after his feats of strength. At around 1:00 am on July 3, 1904, feeling tired, he drank a cup of tea and began coughing up blood. He was rushed to hospital but died the same night. Doctors who examined BeauprÃ© post mortem found that he was suffering from a pituitary gland tumor. They also discovered that he hadn't stopped growing until his premature death at the age of 23. Born in 1909 in Helsinki, Finland, VÃ¤inÃ¶ Myllyrinne was 7 ft 3.4 in tall by the time he was 21. What's more, he hit a second growth spurt in his late thirties, and by the time of his death in 1963, he was a towering 8 ft 3 in – just like KÃ¶sen and BeauprÃ©. Myllyrinne served with the Finnish Defence Forces and is considered the tallest soldier who ever lived. He was also voted the twelfth greatest Finn by local TV show Suuret Suomalaiset, mostly due to a sarcastic tongue-in-cheek Internet campaign. The Finnish colossus suffered from acromegaly, which frequently leads to gigantism and abnormal growth. Myllyrinne was confirmed as the tallest living man in the world from 1940 until his death at the age of 54. His hands were also an incredible 15.7 inches wide, which is the largest recorded hand span in history. Born in 1932 in Buffalo, New York, John Carroll was referred to as the "Buffalo Giant" in medical journals. When he was 16, Carroll's incredible growth spurt kicked in, and it didn't stop until his eventual death in 1969. At one point, he reportedly grew seven inches in a matter of months! Carroll was afflicted with acromegalic gigantism and suffered a lot during his short life, especially when it came to his spine: he had a bad case of two-dimensional spinal curvature, also known as kyphoscoliosis. In fact, Carroll's spinal curvature was so severe that it even made measuring him accurately extremely difficult. In 1968, just before his death, Carroll measured in at 7 ft 8.75 in. However, by this stage, his spinal curvature was so extreme that it's thought his corrected height could have been just below 9 feet. At 8 ft 9 in, John William "Bud" Rogan is the second tallest human being in recorded history – and the tallest of African descent. Born in Tennessee in 1868, Rogan suffered a sudden growth spurt at the age of 13 and gained height rapidly. Rogan's extreme size led to him suffering from severe ankylosis, a condition that leaves the joints stiff due to inflammation. This made it extremely difficult for him to put his weight on his feet. Initially, he could walk around with the aid of crutches, but by 1882 Rogan couldn't stand or walk at all. Always the center of attention, he was often pulled around in a goat cart that he designed himself. Rogan found it hard to work due to his condition but made a living selling pictures and postcards of himself at the local train station. He died in 1905 from complications due to his disease and was buried under a layer of concrete to stop curious scientists from digging up his body. The African-American giant was not measured officially until his death, and although he was just less than nine feet tall, he weighed in at only 175 pounds. Topping our list is Robert Wadlow, "The Giant of Illinois." Having reached a height of 8 ft 11 in, Wadlow is the tallest confirmed person to have ever lived. Born in Alton, Illinois in 1918, he suffered from hypertrophy of the pituitary gland, causing him to produce massive amounts of human growth hormone. This condition led to Wadlow's height constantly increasing throughout his life. By the time he was eight, he was already 6 ft 2 in and weighed 169 lbs (77 kg). The Illinois resident was so large that a special desk had to be built for him in school. Doctors at the time had no treatment for this kind of hormonal imbalance. Wadlow suffered from a number of ailments due to his unusual condition. He had trouble moving around his college campus because of his brittle bones and needed to wear leg braces towards the end of his life. He also had minimal sensation in his feet. In the end, during a professional appearance Wadlow made in Manistee, Michigan, a faulty leg brace gave him a blister that went on to become infected. Emergency surgery and blood transfusions failed to save him, and he passed away in his sleep on July 15, 1940. He was only 22 years old. Over 30,000 people attended Wadlow's funeral and twelve pallbearers were needed to carry his massive body. The world of medicine is undergoing a digital revolution, and tablets and tablet apps are playing a key role. Reference apps, diagnostic apps, monitoring apps, and billing apps are now commonplace. Here are 15 great iPad apps for healthcare professionals. Medscape is a free application for iPads. It is very useful for healthcare professionals and healthcare students. It is a pool of articles, news and factual information updated on a daily basis. It features medical news and information about drugs, diseases, conditions and procedures. AHRQ stands for Agency for Healthcare Research and Quality. This app was created to let healthcare providers research available services suited for their clients. The information provided comes from the top agency for research on the quality of health care. Radiology 2.0 is not just for radiology students. It is also perfect for medical students, doctors or any other healthcare professionals who want to study how to interpret CT scans. This application is available for free. The file includes basic information and common cases so that doctors and even medical students can interpret a CT.
With the help of this application, healthcare professionals can now perform a virtual upper respiratory diagnostic test or procedure. It looks like the real thing so that patients will have a better understanding of their condition. This app was created for healthcare providers to use for patients who have problems with their heart. It stores data like previous ECG readings so that results are available for analysis and review. This application is perfect for medical students because it gives a clear and fun presentation of the muscle system's anatomy and physiology. This is useful because it has animations, models and skill tests like finding a muscle attachment to the bone. DrChrono EHR is an application that lets healthcare providers access medical billing and operation schedules. Using this application, the clinician will be able to view a patient's medical history and condition including medications. The application promotes paperless billing. AirStrip lets the healthcare provider access patients' records including laboratory results, inputs and outputs, medications and vital statistics. This application is good because the doctor can do assessments and make orders necessary for the patient's welfare even if they are not at the hospital. This makes health education easy and fascinating. The application includes 3D animations of models and wonderful pictures and presentations of medical conditions and interventions. It is easy to facilitate learning and understanding health conditions with this application. CardioTeach makes teaching patients about coronary conditions easy and understandable. The application offers information about heart ailments so that patients will understand their condition. It also gives information about specific and necessary interventions to make the patient feel better. Images from MRI, PET, CT and SPECT scans can be viewed using Mobile MIM. Ultrasound results and X-rays are included in the modalities that the application can access. However, mammography won't work with this application. Mobile MIM is helpful in reviewing images to improve patient care. OsirxHD makes the lives of healthcare professionals easy. Using an iPhone or iPad, you can view medical images of different modalities. Transferring images is not a problem using wifi or 3G. Anyone can instantly control and manipulate images within seconds. Writing prescriptions the old way is really time consuming. With the help of Rx-Writer, writing prescriptions for patients is very easy and doesn't require much time. There is no need for the doctor to meet their patients face to face. The application sends the prescription directly to the pharmacy in less than five seconds. All surgical data and other necessary information about patients is stored in SurgiChart. It is very easy to access a patient's surgical chart even if the doctor or practitioner is not at the hospital. It only takes one click or tap to get the information that you need. This application lets you see a variety of images of illnesses. VisualDx is used to visualize the patient's diagnosis and properly provide medical interventions and solutions. Clinicians will be happy to search for information about a specific condition in just a second. VisualDX will give you everything you need from diagnosis to intervention and prognosis. There are thousands of iPhone apps available on the market, but few serve as crucial a role as apps for healthcare professionals. Read on to learn about the top iPhone apps for healthcare professionals. Medscape provides medical information and educational tools to health professionals. Medscape users can access medical news, book reviews, journal commentary, review articles, patient education articles and conference coverage. The app even uses your registration profile to provide you with a personalized specialty site that pertains to your particular healthcare interests. Epocrates provides several medical apps that offer drug reference information for brand name, over-the-counter and generic medicines. The apps also offer pill identification and drug interaction checks. Epocrates Rx Pro includes information on infectious disease treatments and alternative medicines. Epocrates Essentials Deluxe provides users with drug and disease monographs as well as diagnostic tools, billing codes and a medical dictionary. The DrChrono EHR patient care platform is a unique EHR that physicians can use on their iPads to provide better patient care. Patients can update their information in real-time, and physicians can take advantage of the system's electronic medical billing, speech-to-text, drug interaction tests and e-prescribing features. Physicians can even qualify for $44,000 in government incentives by using this certified EHR. Evernote is an app that allows users to store information that is on documents and webpages to be viewed anywhere at any time, whether there is an Internet connection or not. Medical professionals can use it to store notes, collect travel information in a single place, save and send presentations, store useful references and much more. Radiology 2.0 is a unique and free app that offers innovative educational resources to radiologists and radiology students. The app's users can simulate reading CT scans and read extensive discussions after each case that include labeled images to point out pathologies and any other relevant findings. The content is even contained within the app so it can be viewed without Internet connectivity. Blausen Human Atlas app provides medical students with an incredible interactive resource that displays 3D animations with narration of medical conditions and treatments. This easy-to-use medical app allows users to manipulate the app's library of over 8,000 animations and 15,000 illustrations with just a touch of a finger. The EyeDecide MD app teaches users about the anatomy of the eye as well as about conditions and best practices. Users can get a first hand look at cataracts, conjunctivitis, dry eyes, floaters, glaucoma and other eye conditions. The app also provides help finding specialists using its directory and the user's location. The AirStrip Patient Monitoring app is available for clinicians who care for patients. Healthcare providers can view their patient's monitoring data from just about anywhere at any time of day or night. Use this app to view patients' vitals, medications, allergies, cardiac waveforms, lab reports and more. VisualDx is an app that is a clinical decision support system. VisualDx has been proven to improve diagnostic accuracy, help therapeutic decisions and even enhance patient safety. Healthcare providers can access a database by searching by diagnosis, looking up drug-induced adverse reactions and viewing images of pediatric and adult conditions. The healthcare system is undergoing major changes. Will these changes make us healthier? The following TED Talks provide a glimpse into the ways in which medical visionaries are utilizing technology and age old wisdom to transform healthcare. Rebecca Onie knows that good health is not just a matter of having the right pill to swallow. Onie highlights the work of Health Leads, an organization committed to providing quality volunteers who pay attention to a patient's needs outside the hospital doors, such as good food and safe shelter. Have you ever tried to read your medical chart, only to give up after being unable to decipher the medical jargon? Thomas Goetz shows how redesigned medical charts can provide us with a wealth of important information about our health. The marked increase in medical scans has produced the side effect of doctors now having thousands of images and too little time to sort through them. Anders Ynnerman explores emerging visualization technologies that will assist doctors in determining how to best use these scans in patient care. Mathieu Lehanneur is a designer who partners with scientists to create innovative and even whimsical new devices that will improve our health and quality of life. Lehanneur's creations include air filters, light therapy lamps, and asthma medication reminders. In a medical landscape full of expensive new technologies, Atul Gawande wants to make sure that doctors remain grounded in the basics of providing quality care to patients. Gawande provides common sense (and cost effective) ways for doctors to improve standards of care. In this provocative talk, Ivan Oransky asks us to consider that we are too fixated on preventing ill health, to the point of taking medications that may actually lead to further illness. Oransky looks outside the medical field to world of baseball for a new paradigm. How might your health be affected if you lived in an area with high rates of water or air pollution? Bill Davenhall advocates for using geo-data technology in combination with traditional diagnostic criteria to evaluate patient health. The rapid increase of technology in healthcare may have a downside: the loss of face to face human interaction. Abraham Verghese is a doctor who wants to make sure that physicians take the time to truly listen to patients and make sure that tests are used as a tool instead of a replacement for interaction with the patient. Robert Fischell is recognized for his major contributions to medical technology, such as the rechargeable pacemaker and implantable insulin pump. But he's not done yet: Fischell outlines "three wishes" for medicine: new treatments for both migraines and mental illnesses, and reform of malpractice law. The rapid pace of technology is impacting the medical field in a big way. Daniel Kraft explores how innovations in digital medicine have changed diagnostics to bring digital test results directly to both patients and medical staff. This article was written by experts. Specifically, the health physics team in charge of protecting workers, monitoring releases and recording doses at Three Mile Island during the month after the worst nuclear accident in American history. 2011 was the year when average people all over the world were suddenly confronted with the very real and serious dangers to human health presented by "peaceful" applications of nuclear technology. The triple meltdowns and subsequent explosions at the Fukushima Daiichi reactor complex in March sent plumes of radioactive contamination across the northern Japanese countryside and high into the atmosphere to blanket the entire northern hemisphere with dangerous fission product isotopes most people had never heard of before. Confusing and contradictory reports from officials around the world left too many people unsure of what dangers they and their families face from fallout, the actual levels of radioisotopes in their air, food and water supplies, and how those will continue to present dangers for decades (and, in some places in northern Japan, centuries) to come. The pro-nuclear lobby repeatedly claims that radiation exposures are "harmless" or even "good for you," academic experts have insisted just as repeatedly that there is no âsafe' level of exposure. Whom should we believe? Since it is often true that the best defense is a good offense, here are 15 practical methods of reducing exposures to radiation and radioactive contamination in homes, schools and offices, from a group of health physics personnel, the technicians charged with exposure control at nuclear facilities of all types. The techniques are effective whether the exposure is acute – an accident or release at a nuclear facility nearby that is not expected to be long-term – or chronic low-level exposure such as from fallout caused by major accidents or bomb explosions. You need not own a radiation detector* to monitor actual levels in order to practice these techniques as a matter of habit, and they will be effective even against other natural and unnatural pollutants/allergens that may be ubiquitous where people live. One thing Fukushima has taught us is that âofficials' are not trustworthy for providing accurate and timely information about radiation levels – or the presence of toxic effluents from other industries and accidents – to the public. Thus it is best in times of uncertainty to err on the side of precaution. * Since Fukushima several inexpensive models of hand-held low-level radiation detectors have come on the market, including at least two downloadable applications for high-end cell phones that are fairly accurate and recommended for people who live within 50 miles of a nuclear facility. Which, in the United States, includes an estimated 116 million citizens. Radioactive particles are much smaller than even the tiniest dust particles and cannot be seen. But if you assume that all the dust in your indoor environment is radioactive, careful cleanliness will protect you against excess exposure from unseen particles as well. 1. It can help to visualize a layer of invisible dust even when surfaces look clean and shiny. You will want to wash the walls, counter tops, furniture and appliance surfaces and floors regularly. Each time, use a clean mop and sponge, keep a good supply of paper towels, plastic grocery and trash bags, and sturdy trash containers with tight-fitting lids on hand. Always wash from top to bottom, at least once a day. Dispose of all used mop heads, sponges and wipes in a trash container outside. DO NOT dry-dust or sweep or use a feather-type duster, as these will simply cause dust (and isotopes) to become airborne where they can be inhaled or settle onto food, etc. Most people are aware that carpets, rugs and floor matting are dust-magnets. These cannot be washed daily in an effective manner, and often cannot be removed for the duration of the danger. Daily or twice daily vacuuming is recommended, but be careful of older vacuum cleaners that often have âleaks' that stir more dust into the air than is sucked into the bag. 2. A good filtered vacuum is baseline requisite. Replace the filter regularly with the finest grain filter available for the unit, and wash it carefully after each use even if it doesn't look dirty. Place all disposed filters and dust bags in tightly closed plastic grocery bags in a trash bag lined, closable outdoor container. You do not want concentrated contaminates from cleaning to remain inside. A water-filtered vacuum is preferable to a regular vacuum if you can get one. Good shop-vacs will work for this. Dispose of contaminated water down the toilet, then clean the toilet – including seat – thoroughly with fresh water. Also, a water-filtered or virus-rated air filtered indoor air purifier is a good idea to run several times a day following your cleaning regimen. This will remove dust that cleaning activity has caused to go airborne. The danger of ingesting radioisotopes is significant, as internal contamination is 20 to 100 times more harmful than external exposures. Alpha and beta particle radiations do not present significant external exposures at all in low levels, but once they get into your body they can easily damage or destroy sensitive cells. Thus some careful kitchen habits will go a long way toward limiting internal exposures. 3. Always keep your pots, pans, plates, silverware and utensils in clean cabinets with doors/covers, drawers or covered containers such as Tupperware bins. Remove coverings carefully so as not to shake the dust they may have accumulated out into the air or onto previously clean surfaces. 4. Always rinse your cooking utensils, plates, silverware, glassware, etc. in clean – preferably filtered – water before using them. The best filters for the purpose use activated charcoal or reverse osmosis, as these are quite effective at trapping the most dangerous radioisotopes. Change the filter every two or three days during the entire course of the radiological emergency. Wrap used filters in tightly closed plastic grocery bags and keep them in the lined âhot trash' container outdoors. 5. Be sure to rinse the outside of all food cans before opening (with a well-rinsed manual can opener). Wipe rinsed articles off with a paper towel and dispose of those in the same outdoor âhot trash' container. Every time a human or pet comes into the indoors from the outdoors, they will be bringing contamination with them. Limiting this new source of contamination is important to limiting indoor exposures. 6. When you go outside, wear a set of coveralls or a duster over your clothes. Rubber boots over shoes is a good idea as well, especially if it is raining. Fallout contamination in rain can be 10-20 times higher than it is in clear weather. A pair of outdoor shoes is also recommended. None of these items should come inside, but should be left outdoors on a porch or landing, or confined to the entry area. 7. Shower every time you come indoors from having spent more than a few minutes outdoors. Always wash from top to bottom, and don't ingest any of the wash water. Avoid breathing steam by using cool, lukewarm or just slightly warm water. 8. Obtain a supply of good quality dust masks to cover your mouth and nose, and ALWAYS wear it when outdoors or traveling in your vehicle. A utility painter's type mask is better than a flimsy medical type mask, available from hardware and home improvement stores. Or you may choose to use handkerchiefs if they are made of a tightly woven fabric. Fold it to provide more than one layer of cloth and cover mouth/nose as tightly as possible and still allow breathing. The "Shelter In Place" advisory we heard about for citizens outside the evacuation zone around Fukushima was intended to limit residents' exposures to the radiation levels outdoors. It did not work very well due to public ignorance of the need to keep outdoor air and contamination out of indoor spaces, but the basic premise is sound if these listed methods are followed carefully, along with all other recommendations given here. 9. Seal all doors that open to the outside with duct tape. Use only one door for entering and exiting, preferably a door that enters into a semi-enclosed entry space, garage or âmud room'. Make that space into a "change over" area for protective outdoor clothing and footwear. 10. Windows should also be tightly closed (even if it's nice outside) and sealed with duct tape for the duration of the emergency. Run your air conditioner at least 12 hours a day using the "recirculation" setting, even when you are not using the heat or cooling cycles. Get fine filters and change them daily. If using foam filters, these may be carefully washed and allowed to dry after changing, but fine-grain fiber dust filters that are disposed of as âhot trash' after changing are better. Do NOT use fans to blow outside air in, or run AC units on settings that draw outside air inside. Take steps to keep indoor air from being too dry. A semi-humid environment lets water vapor attach more particulate contamination and bring it down to floor level so it's not floating around where you are breathing. Dogs, cats and small children are much closer to the ground than upright adults and will tend to absorb more contamination. What may be a non-dangerous "extremity dose" to an adult walking with his or her head well above the ground can present a contamination danger to crawlers, toddlers and pets – especially dogs, who are prone to sniffing the ground regularly. 11. Always carry young children while outdoors or going to and from a vehicle. Avoid taking them out in the rain if at all possible, and do have them wear mask, hat and some kind of outer covering like a duster, blanket or coat. At home, try not to let children spend a lot time on the floor. If they must be on the floor, spread a clean sheet onto it first. 12. Keep pets indoors as much as possible for the duration. If you must let the animal outside for a period of time (keep it short), keep a wash tub near the door along with a supply of clean towels. Wash them down (top to bottom) before bringing them indoors, where you can towel them off. Keep a closed hamper in or just outdoors of your entry zone to receive used towels and outer clothing bound for the laundry. 13. All family members (including pets) should sleep at least two feet above the floor for the duration of the emergency – or for as long as there are reports or suspicions of elevated radiation levels – to keep radioactive contamination well away from nose and mouth. You may have to let the dog sleep on the couch to accomplish this, so do cover your couch or other likely animal bed surfaces with clean sheets and change them daily. 14. Regular laundering of sheets, handkerchief masks, outdoor clothing, etc. should keep them fairly free of contamination. But wash the more contaminated items separately from regular laundry so as to avoid possible excess contamination to all your laundry. DO NOT hang clean laundry on an outdoor clothesline. Use your dryer (and clean the filter after every load, treat the lint as âhot trash') or hang indoors overnight to dry. 15. Keep following all these procedures for several days or even a week or two after the "danger" appears to have passed, as residual radiation and contamination may still be in the environment. wrestling the kids out on the lawn or splashing around in mud puddles may be fun pastimes you must give up for a long while. Depending on the isotopes present in the environment, the danger may persist for months or years. A radiation detector is handy for locating hot spots in and around your property, and these will tend to be found in normal drainage pathways such as eave gutters, underneath downspouts and along drainage ditches. If you find any of these, avoid them carefully until you or some official remediation outfit can effectively decontaminate them. Do not attempt decontamination or remediation yourself unless you know what you're doing and take serious precautions for your own safety. Remember, some common isotopes have long half-lives and will tend to concentrate to remain dangerous for centuries. If it looks like this is to be the situation where you live, it may be for the best to relocate farther from the source. This can be especially true for those who grow food or raise livestock on the land. Some nasty isotopes are readily uptaken by food plants and concentrate in them to present internal hazards to all who consume them. No one but you can make such a decision for the long-term well-being of self and family, and it's a hard decision to make. The world has not faced such serious contamination concerns since the atmospheric bomb testing days and the accident at Chernobyl in 1986. Contamination from Fukushima will be with us for many years. These simple health physics techniques can help minimize exposures, but the best protection is to avoid exposures in the first place. Toward that end, I wish us all the best of luck.